The sheer Organza wraps are available in some lovely shades as shown on our colour chart. Click on the image for more information. This is a pretty but simple bolero jacket that can be added to your outfit to cover the arms and shoulders and yet still reveal the beauty of the bodice worn underneath. Our Sparkly Organza wraps are available in 10 shades as shown on our colour chart. Click on the image for more information. A Winter Wedding stole in beautiful fake fur. 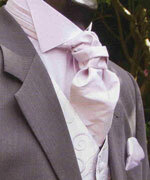 for almost every shade of Pure Silk Cravat you can imagine! Matching Cravat & Handkerchief sets for the Groom, Best Man or Ushers, in a huge range of colours, perhaps to match the Brides or Bridesmaids dresses, a specific wedding theme, or any other colour of your choice. Postal service: Royal Mail Special Delivery. P&P for Organza or Sparkle Organza Wraps - £5.00 per single wrap. For larger orders add £1 per each extra wrap included in the same parcel, i.e. - 2 wraps £6, 3 wraps £7, and so on. P&P for Bolero Jacket - If shipped separately - £8.00. If shipped out together with a gown add £2.50 on to gown P&P costs to cover jacket. 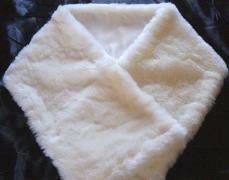 P&P for Fake Fur Stole - £6.00 per fake-fur stole. If ordering more than 1 stole, add £2.50 extra P&P for each extra stole dispatched in the same parcel. Delivery (within the UK) - ALL PARCELS REQUIRE A SIGNATURE ON DELIVERY. Please allow 14 to 30 days for delivery on wraps and stoles, and 30 days delivery on the Bolero Jacket. Overseas deliveries: Please use our feedback form to contact us and we will calculate delivery costs for you. All content, including garment designs and site graphics © 2003-2009 The Frock Factory. All Rights Reserved.